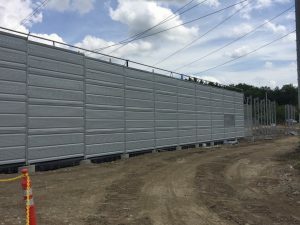 The fence at Eversource’s Substation 447 in Walpole is being erected! After several redesigns, the project has gotten some steam. Eighty-five percent of the fence foundations have been finished while the rest are being formed. McCourt has been erecting the fence with a pace that is better than anyone expected. Once the project is complete, it will be one of two substations in the state with this new fencing system.